A Quiet Corner: An Award? Last week I received a blog award from Sandie of Chatty Crone. I've been following her ever since I can remember! Her posts tell of day to day activities sometimes, are filled with jokes and humor other times, life's ups and downs and ALWAYS...ALWAYS...how to get through! 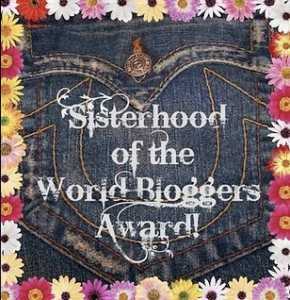 Although I like to chat, I sometimes wonder what people would be interested in learning about me so, I've listed a few things about myself and have picked a few candidates so I can pass on this auspicious award...Sisterhood of the World's Bloggers! 1. I don't like to be hot. 2. I am not talented at all when it comes to doing my hair (which is why I keep it so short). 3. I love meeting new people. 4. I am a "neat freak" as well as a "clean freak." 5. I've had my blog for two years! 6. I'm a nuturer by nature. 7. I am VERY independent. 8. According to Chatty Crone's (aka Sandie) "First Four Word Scramble,"I am lovely, passionate, naive and thoughtful." LOL!!!! Congratulations on the award...well deserved, and thank you for passing it on. Congratulations on the award and thanks for sharing with me. Congratulations on your award! You are also a reliable, compassionate, caring, wonderful blogging friend too!